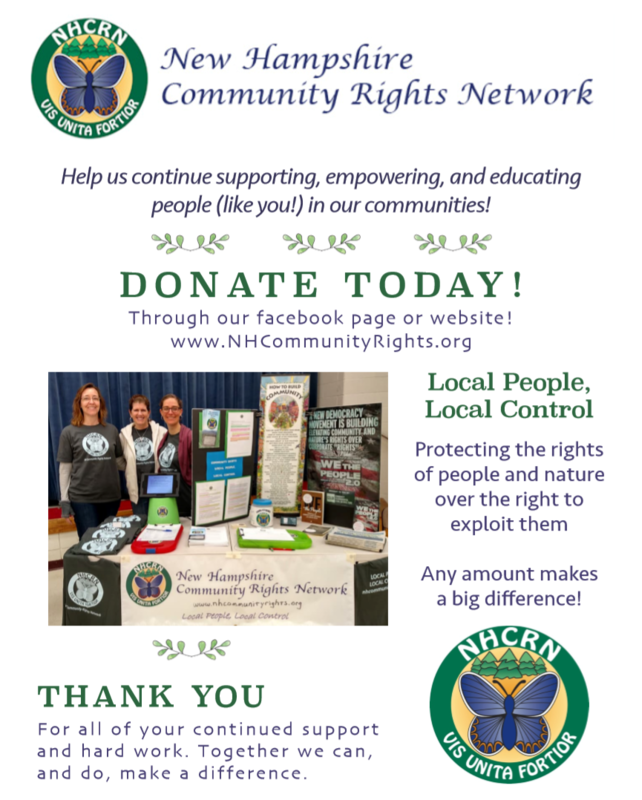 The NHCRN educates and empowers communities and elected officials about our individual and collective right of local self-governance in order to secure and protect the inherent and unalienable rights of all inhabitants of New Hampshire to economic, social and environmental justice, including the rights of nature. ​Citizens don’t want to hear apologies, they want their state representatives to represent them and not the special interests that have purchased the political parties. ​on CACR8. Here's their contact info. They need to hear from YOU! BRING A NHCRN FUNDRAISER & EDUCATIONAL EVENT TO YOUR COMMUNITY! Alliance for Newmarket Citizen & Ecosystem Rights (ANCER) partnered with NH folk trio Oak & Ivy for a fundraising event to benefit NHCRN's work educating elected officials and communities about the right of local community self-government. The show included two great sets from the trio with a brief presentation on NHCRN's work in between. It was a great event for people, planet, our local ability to protect both, and NHCRN's efforts to help mobilize this people's movement. and educational event to your community, please email info@nhcommunityrights.org. Stay Connected -- Join NHCRN on Facebook! The NHCRN is raising funds to Protect NH's People & Places. Your contribution will make an impact, whether you donate $5 or $500. Every little bit helps. Thank you for your support. Join the cause and become a champion for New Hampshire! Give today! Communities across New Hampshire are calling for democratic and environmental rights to protect their communities from harm. Communities are looking to the NHCRN to advance their rights and challenge our legal and governing system. Further, they are now driving forward a first-of-its-kind Community Rights state constitutional amendment. Earlier this year, that amendment was debated and voted on in New Hampshire’s House of Representatives. The proposed amendment, advanced by the NHCRN, recognizes the authority of people in towns throughout the state to enact local rights-based laws. It empowers people to use their local governing authority to protect the health, safety, and welfare of both humans and natural environments. It removes communities’ vulnerability to state and corporate power, safeguarding them from corporate exploitation. Give to Protect NH People & Places! 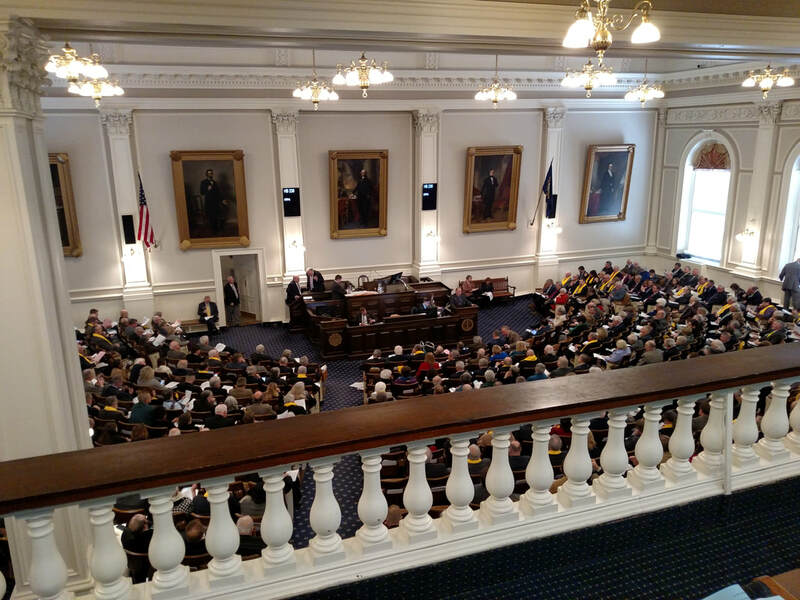 ​The NH Community Rights Amendment received support from a legislative subcommittee with a recommendation of “ought-to-pass”. And in its first attempt on the House floor, it received support from one-third of the body present and voting – more than halfway to the required three-fifths majority needed for advancement to the state Senate. The NH Community Rights Amendment has been reintroduced in the 2019 legislative session because our quality of life, indeed our very lives and those of our children and future generations, depend on it. You can become a champion! help Community Rights spread statewide in New Hampshire. $25 covers educational materials for 2 people. 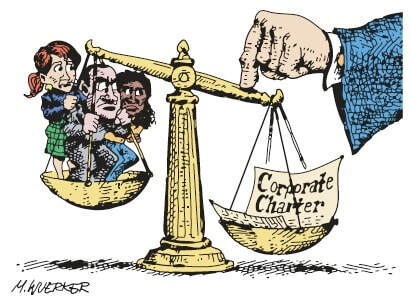 $50 ensures a community member can attend a Community Rights workshop, teaching the tools needed to confront corporate control and state interference on a powerful single front: people’s and nature’s inalienable rights. $100 covers travel expenses for our community organizer to speak at an event educating Granite Staters on Community Rights at the state level. $250 allows us to print and distribute informational handouts on Community Rights and the state amendment process. $500 allows us to provide 10 scholarships to community members to attend a Community Rights workshop.